The AWC is proud to announce the publication of Lucky, an educational children’s book that gently awakens children to the plight of captive birds and birds captured in the wild. Lucky! 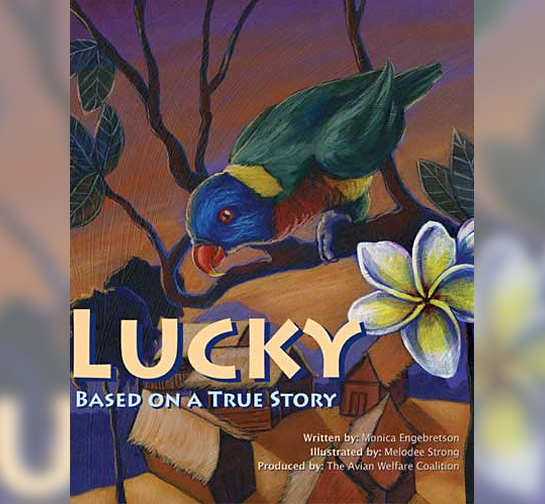 - This children’s book — based on a true story — tells the story of Lucky, a parrot who is captured in the wild and eventually regains his freedom with the help of a young Indonesian boy. The book teaches children to be kind to animals and is a natural fit for a wider educational curriculum including geography and culture of Indonesia, the natural history, behavior, and physical characteristics of parrots and tropical forest ecosystems, as well as real-life conservation efforts. Originally written in 2004, this much-awaited story is finally available to the public in this beautifully illustrated 32-page soft cover “perfect bound” book is printed on recycled, chlorine-free paper to protect the environment and the world's forests. What's more, 100% of the proceeds from the sale of this book benefits avian welfare, rescue, and conservation — to help birds like Lucky. Lucky was made possible through the support of the World Society for the Protection of Animals (WSPA), the ASPCA, Animal Welfare Trust, Born Free USA, and Midwest Avian Adoption & Rescue Services (MAARS). T-Shirts, Mugs, Bumper Stickers, etc. Show your support for the well-being of captive parrots and start conversations with AWC logo and "Don't Breed. Don't Buy. ADOPT!" t-shirts, mugs, bumper stickers, and other items. You can purchase these popular items securely through our AWC CafePress store. $25.00 PER COPY (including shipping) , contact: info@avianwelfare.org to order your copy.